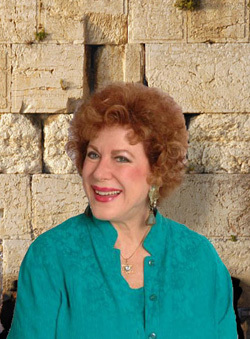 From major events in Jerusalem and throughout Israel, from The White House and across America, from public appearances in Canada and ministering in Ukraine and Russia, from the Olympic Stadium in Germany and ministry times in The Netherlands, France, Italy, Austria to Egypt, Jordan and Korea (in Dr. David Yonggi Cho's church in Seoul), Sandra has brought to her audiences songs of adoration for Yeshua HaMashiach (Hebrew for Jesus the Messiah) and songs of love for Isreal, with compelling love, vibrancy and immense depth of feeling. As an Orthodox Jew who found her Messiah in her youth and who has experienced His healing power, this has been her passion in life. During more than 12 years of marriage to Messianic Jewish Rabbi Manny Brotman, internationally respected Messianic Jewish pioneer, visionary, spiritual leader, TV and radio personality, together they shared, until his promotion to Heaven in 1999, God's burden for His Chosen People. Through Sandra's concerts, speaking engagements, and on the nationally televised THE TODAY SHOW, 700 CLUB, TBN, PTL CLUB, and 100 HUNTLEY STREET across Canada, she brings to her audiences the songs of Israel and Yeshua with compelling love, vibrancy and immense depth of feeling. She was the only Jewish soloist at Washington For Jesus '88 with over one million in attendance. In an unprecedented way, she uses drama to enact a baby's first 12 weeks of life in the womb, at the end of which her mother murders her by abortion! Having lost most of her own Jewish family in Poland during "Hitler's Holocaust", she also decries the slaughter in America of over 56 million unborn babies since the U.S. Supreme Court's 1973 Roe versus Wade decision, which she calls, "The American Holocaust of Abortion". Sandra has produced powerful "tools for the Jewish Harvest" found on this website to help turn the hearts of Bible believers with love toward the Jewish People and the hearts of the Jewish People toward their promised Messiah, following the biblical pattern of 1 Corinthians 9:20: "Unto the Jews, I became as a Jew, that I might win the Jews." and protection for God's Chosen People. Endorsement by George Beverly Shea, "America's Most Beloved Gospel Singer"